This Little Book Provides an Innovative Approach to Develop Students’ Spirit, Purpose, and Potential! 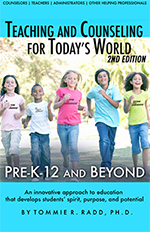 This easy to read, practical book is a guide for teachers, counselors, administrators, and other helping professionals. The focus of the book is to provide an innovative approach to education that develops students’ spirit, purpose, and potential. Click here for a preview of it! Learn what students need to know in order to be successful! The book contains a wealth of information, examples, charts, tables, and an expanded glossary. Provides effective teaching approaches based on educational best practices! Meets and exceeds the national school counseling standards and counseling model!